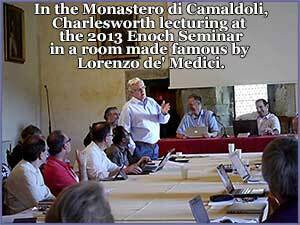 Enoch Congress, 2013, Charlesworth presented lecutures, this photo taken in a room made famous by Lorenzo de' Medici in the eleventh-century in the Camaldoli Monastery. "I am back in Israel (editing the Hodayot for the Princeton Project) and thinking about the Enoch Congress that was held in the high mountains between Rome and Florence. I am pleased I helped Gabriele Boccaccini, Professor of Early Christianity and Professor of Judaic Studies, University of Michigan, establish this forum for dialogue among the best scholars and to enjoy the process of learning and growing in ways to comprehend better the complex and creative world that defined thinking in ancient Palestine, especially before 70, when so much changed. I think the consensus of about 50 scholars from 18 countries evolved to recognize many levels of influences from the BOOKS OF ENOCH upon the Evangelists. The BOOKS OF ENOCH were composed from c. 300 BCE to 70 CE. One influence that is certain is that mastering these books helps us imagine not only the intentions of an Evangelist, but also how the Gospels may have been read in antiquity, especially by Jews and Jewish converts to the Jesus Movement, and how they should be comprehended by us today." The Enoch Seminar is an academic group of international specialists in Second Temple Judaism and the origins of Christianity who share information about their work in the field and biennially meet to discuss topics of common interest. Supported by the Department of Near Eastern Studies of the University of Michigan and the Michigan Center for Early Christian Studies, the group gathers about 200 university professors from more than fifteen countries. The Enoch Seminar focuses on the period of Jewish history, culture and literature from the Babylonian Exile (6th century BC) to the Bar-Kochba revolt (2nd century AD) — the period in which both Christianity and Rabbinic Judaism have their roots. "Camaldoli was founded in c.1023-24 by St. Romuald of Ravenna, who established a group of hermit dwellings and a chapel on a gift of land situated at 1,100 meters in the Tuscan-Romagna range of the Apennines. At an existing refuge lower down the mountain, at about 800 meters, Romuald assigned several monks to provide food and lodging for travelers and pilgrims crossing the mountain pass. The refuge became a monastery maintaining a guesthouse. 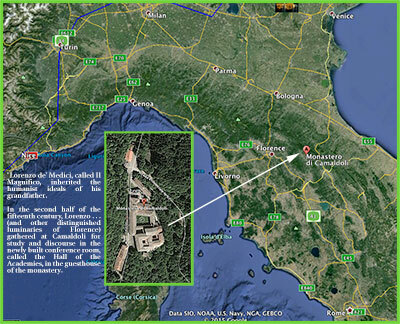 The monastery and hermitage formed a single monastic community. 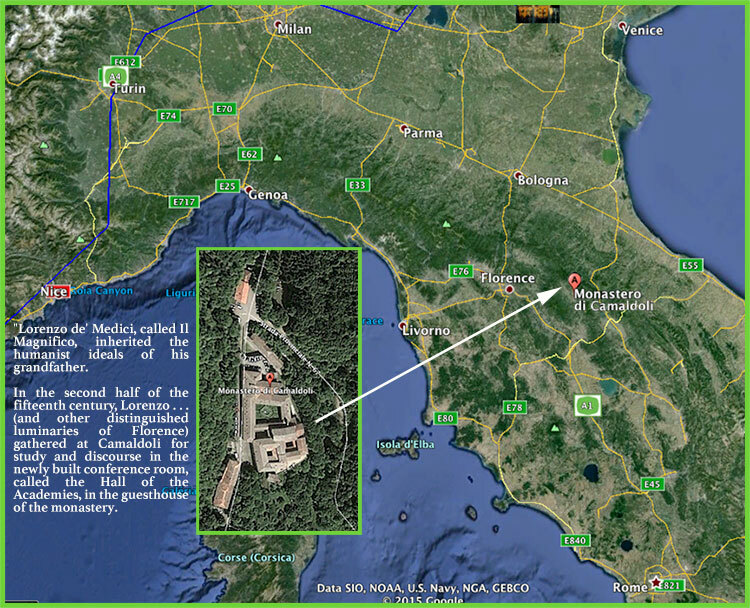 By the twelfth century, Camaldoli was the head of a cenobitical-eremitical congregation, numbering more than twenty monasteries and hermitages, within the Order of St. Benedict, also known as the Benedictine Order. "Lorenzo de' Medici, called Il Magnifico, inherited the humanist ideals of his grandfather. In the second half of the fifteenth century, Lorenzo, his brother Giuliano, and other distinguished members of Florence's Platonic Academy, including the philosopher Marsilio Ficino; poet and man of letters Cristoforo Landini; and architect and art theorist Leon Battista Alberti gathered at Camaldoli for study and discourse in the newly built conference room, called the Hall of the Academies, in the guesthouse of the monastery." "The 'Jewish-Christian Talks of Camaldoli,' promoted from 1980 by the Congregation of the Camaldolesi, are a series of meetings that brought together every year to see the monastery of Camaldoli the many associations of Christian-Jewish dialogue in Italy with the participation of Italian and foreign experts, Jews and Christians of various denominations."